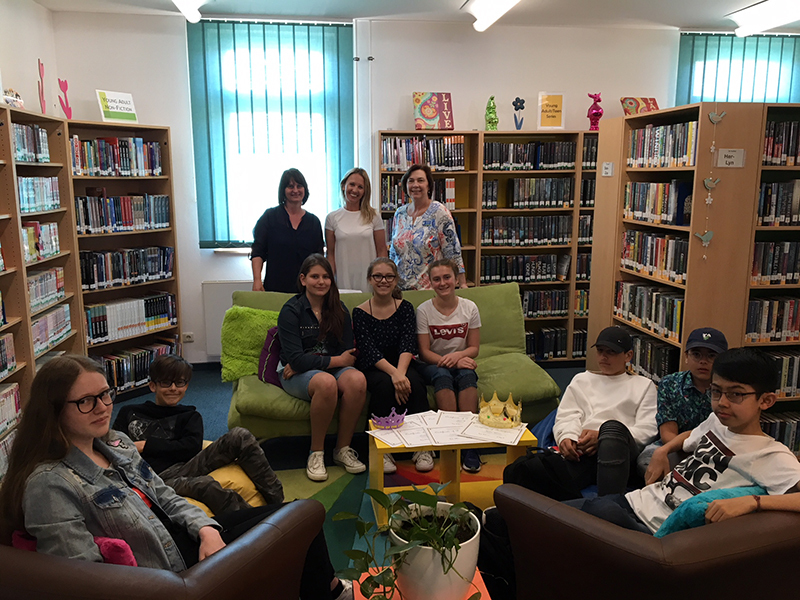 HOHENFELS, Germany — As an encouragement for German students not only to read but to do so in a foreign language, the Realschulen for girls and boys in Neumarkt held its annual English reading contest for seventh graders here May 8. This year, teachers Veronika Northam and Edith Worden asked Nancy Barker from the Turnbull Memorial Library if it was possible for the final rounds to be held at the library, and were more than excited when she agreed to be their host. The eight German students were thrilled to visit “Little America,” and proudly presented their books that they chose to read. Ms. Nan was then faced with the challenging task to judge the students on fluency, intonation, pronunciation and general impression. “I am really impressed by their English reading skills, you almost forget that it is not their native language,” said Nan. After the final decision was made, the Reading Queen/King and Princess/Prince were honored with certificates and goodie bags. All of the contestants used the time after the contest to explore the library, find books they were interested in and work on the library’s puzzle. Goodbyes are never easy, and Lilly the Library Dog certainly makes them especially hard. The girls and boys from Neumarkt will testify to that after receiving such a warm welcome at the Hohenfels Library with its outstanding team. Northam and Worden expressed how thankful they were for their students to be able to compete in such an authentic environment. “They will probably tell their grandchildren one day about that time when they went to America for a day only to perform in a reading contest,” said Northam.